Want a great education without the high costs of a private university? Learn more about the top public schools with the highest-earning graduates. When students are looking for a college education that won’t break the bank, they often think first of public universities. 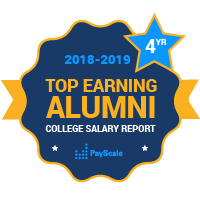 PayScale has ranked hundreds of public colleges by alumni salaries so that you can research how successful alumni of public colleges and universities are and how much they earn, and apply at the top public colleges with the highest-paid alumni. Home to roughly 1,500 students, SUNY Maritime is the perfect recipe for high alumni salaries because it has both strong business and engineering programs. As a result, SUNY Maritime graduates enjoy some of the highest median salaries in both the early career salary and mid-career salary categories when we include alumni who only earn a bachelor’s degree. Military schools top the list for schools with the highest-earning grads in the civilian workforce; the United States Naval Academy (USMA) at Annapolis and United States Military Academy (USMA) at West Point. If military grads need another thing to be proud of, they should definitely take pride in their earning potential. Other military colleges that produce high earners are the United States Air Force Academy and the Virginia Military Academy. It is important to note that we do not include salary data for alumni serving actively in the military, as that is standardized. Students at military colleges get valuable experience as active military members, so it makes sense that they then enter the workforce at higher salary grades than civilian grads. There are many public colleges and universities with strong engineering programs that rank highly on PayScale’s College Salary Report. The Georgia Institute of Technology is recognized nationally for its excellent engineering programs, and as a result often ranks in the top 10. The University of California at Berkeley produces high earners too, even though it does not focus exclusively on engineering. Public schools that graduate a large percentage of STEM (science, technology, engineering and math) majors tend to have alumni with high earning potential, especially for early career salaries, because graduates with those skills are immediately in high demand in our current economy.